Bullock said other than Grinnell, every other Iowa college is tuition dependent. Bullock said the university is always cognizant of costs and its sticker price is one of the lowest in Iowa, but the board has set an aggressive goal for increasing the size of its endowment fund. One of the happiest things about this, of course, is the sense in which it runs counter to the general trend, as documented here. God bless this anonymous donor! For those of you who are using Year B at the moment, here is a sample from the volume, When Heaven Stands Open: Liturgical Elements for Reformed Worship, Year B (Cascade Books). we trust you with our lives. Come, all who wish to act with mercy! in the name of Christ will be rewarded! Come, all who are sick! Come, all who are suffering! Come, all who are in need of prayer! and the Lord will raise them up! Come, all who are cheerful and who long to be righteous! The prayers of the righteous are powerful and effective! Come, all who wish to glorify God! Anyone who does a deed of power can only praise the Lord! Let us all sing songs in praise of God! Watchful God, if you had not been on our side, we would have been lost long ago. But our help is in your holy name; in you, the Maker of heaven and earth! We bless you, O God, our Creator and Keeper, for in Christ you have snatched us from the countless snares of sin and the raging tide of evil. Whatever causes us to stumble along the journey of faith is to be thrown into the fire and burned. That we do stumble is undeniable. What then shall we burn? Let us not hide from God the sin in our lives. Rather, let us offer it up to be burned in sanctifying fire of the Holy Spirit, and ask for Christ’s purifying grace. Saving God, we confess that we have excluded others because we have not considered them a part of us. We are quick to find fault with people of difference and slow to admit the good that you do through them. Reform and renew our sinful hearts, and help us to love you and all your people with greater humility. Be at peace with one another. God has preserved and saved you. Live life now on your guard against sin, making prayer and obedience to Christ’s rule of love your top priorities. Support one another. Keep each other from stumbling. Be healed of all that has weighed heavily on you. And do not return to your former ways. How better to remember God’s kindness to us than by sharing our gifts with one another and with those in need. Let us celebrate God’s goodness. Let us rejoice that the risen Christ has turned our despair into hope, our depression into joy, our mourning into the dawning of a new day. Let us offer our gifts in the Spirit of Christ. and we offer you these signs of our love, in Jesus’ name. Find your help in the name of the Lord, who made of heaven and earth. Place your trust in the name of Christ, who died and rose for you. and may your life in the kingdom of God be renewed. OK, so what would Year E look like? I'm glad you asked. 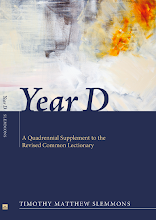 In the Introduction to Year D, I suggest the ideal of a seven-year lectionary (see Deut 31:10-11), and offer a few criteria for Years E through G.
As you may know, Year D does not really address the problem of Acts or Revelation, each of which are treated by the RCL as an epistle, even occasionally using Acts in lieu of the Old Testament, a decision that suggests certain undertones of Marcionism. 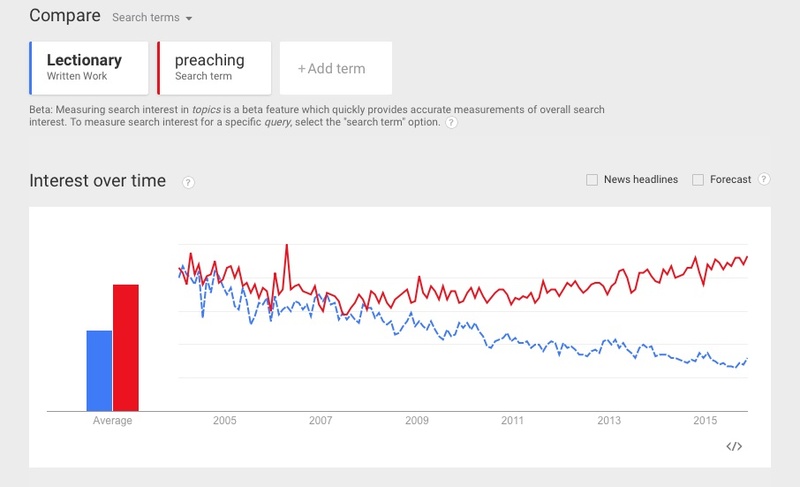 I would suggest, by contrast, treating Acts as the Gospel for Year E and Revelation as the Epistle. This pattern would carry through the entire year, more or less continually, and without any obligatory sense of a need to tie them together, although the juxtaposition may well (and often does) prove very interesting. To address the problem of the Psalms which are pretty thoroughly represented once Year D is added, I've suggested working with other poetic material from the prophetic oracles and the wisdom literature. Meanwhile, since the untreated Old Testament material is so vast, I've suggested two parallel tracks for Year E — yes, a choice would have to be made — which I label OTE1 and OTE2. Furthermore, each track would have to be developed as "episodic," taking into account the fact that an event or episode may span several chapters, in which case the preacher would likely need to select the verses to be read much more narrowly, and devote a significant portion of the sermon to placing things in context. By the way, take a moment to read through the lections from Ruth (First through Third Advent) as is, with all the RCL verses omitted (skipping even the bits in parentheses, which are provided for context, but are also bracketed so as to denote their prior representation in RCL). I find this obverse reading quite interesting, in that, anyone who is at all familiar with the story (esp. by way of hearing it read via the RCL) will find the whole well represented by this partial reading. The impression one gets is of a tapestry that reveals the same pattern on the back as on the front, even if the reverse is the less finished or formally presentable side. 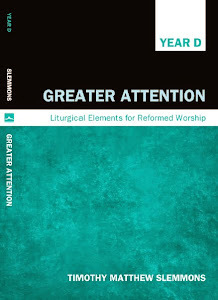 Here is a sample you may wish to consider for this coming Advent and Christmas. OK, that's not quite the way the famous Martin Niemöller quote starts, but it's close enough. Meanwhile, here's another home run from David Solway. UPDATE: Some similar thoughts from the always astute Roger Kimball. A COUNTER-POINT or SOMETHING: Here is an explanation of why this author called for the arrest of the film maker, which, while it may explain her frustration, does nothing apart from offer non-sequiturs as to why she thinks the man's first amendment rights should have been suspended. The obvious question then is, should Bill Maher not then be in jail, and the silly folks at Comedy Central, and on and on and on? Somebody once said the United States is "a nation of laws, not of men." Perhaps they should have added, not of "feelings." O when will the church find the courage and learn to preach "Christ the Offense"?